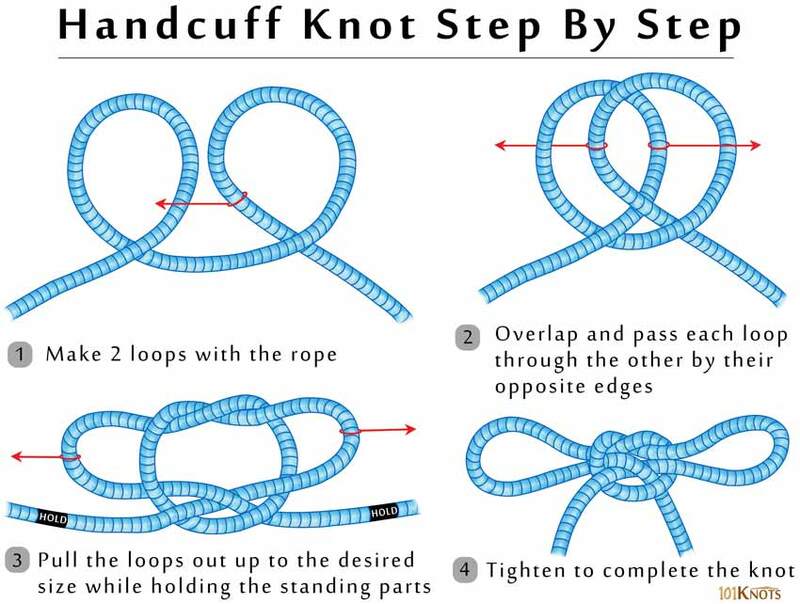 The handcuff knot, also known as the hobble knot forms two loops on a length of rope secured at the center that can be used as makeshift handcuffs as pointed out in The Ashley Book of Knots. However, since it does not have any inherent locking action, it cannot be reliably used for the said restraining purpose. However, it can be locked effectively by tying a single or more overhand knots with the loose ends. It is quick, easy to tie and can be made with rope as well strings, lines, paracord or webbing. The size of the loops can be adjusted by gently pulling them to a bigger or smaller size in step 4. The initial steps resemble the tying of a clove hitch using 2 loops. By firefighters to rescue people from narrow spaces by pulling them by the wrists. However, it is mainly avoided and used only as a last option due to the risk of harming the victim. By cowboys. Tied around the legs of cattle or horses, it would prevent them from wandering too far at night. To lift one up in a seated position by adjusting the sizes of the loops around the thighs thus acting as a chair. When combined with a half hitch over each double loop, effective as a man harness. By sailors and boaters in securing the oars together and lashing them to the rails of a boat. Prusik knot – Though inferior, can be used as handcuffs.